On Saturday 61 teachers from 16 organisations in Mumbai and beyond graduated from ASB's Teacher Training Programme (TTP). This programme has been running since 2011, and we have already had 3 batches of teachers pass through it - one of whom is now employed in our school! In the first 4 years, we ran the programme as a 2 year one, but following feedback last year decided to try it out as a one-year programme this year, with teachers meeting more frequently (on Saturdays). In this batch we also expanded our out-reach - so included teachers from schools in Pune, Gujarat, Madhya Pradesh and Chhatisgarh. Out of the 64 teachers who started the programme this year, 61 of them graduated and around half of them had 100% attendance - even though for some this involved an overnight train journey or even a train journey of 18 hours to attend in one case! Our final session was a reflective one, where the teachers explained how they had put into practice what they had learned. I'm sharing some of their observations here. Inquiry - having students frame their own questions and pose them to each other. The teachers said they have noticed a huge increase in reading comprehension as a result. Some practices they found harder to implement in their schools included the issues of having to tweak the timetable to include morning meetings - though this will be built into their school schedule next year. The morning meeting every day sets a positive environment. They have embraced modern teaching techniques, with around 60-70% of their learning now being activity based. Save the Children - was set up in Mumbai in 1988 and has impacted more than 200,000 children's lives. Its aim is to prevent the exploitation of and discrimination against children. Our local branch of STC runs a special care facility for children with hearing and mental impairments. They have introduced a holistic education with a focus on vocational training. Currently they work with 230 children. Introduced peer learning, with students teaching others. Used Responsive Classroom language with students, in particular reminding language to make students more responsible for themselves. Grouped students for needs-based learning. They noticed a big increase in students taking initiative as a result of all the above. In my first year in India I often said I felt a very strong sense of karma - of being in exactly the right place at the right time - but I didn't know why. The more I get involved in the TTP, the more I feel that this is my reason for being here. These teachers work in the most challenging of situations, and often for lower pay than they would in the state system. After the TTP Saturdays, they are going back to their schools, training their colleagues, and making a difference in the lives of thousands of students. These dedicated teachers are building India's future. I'm humbled to be able to help them in this journey. 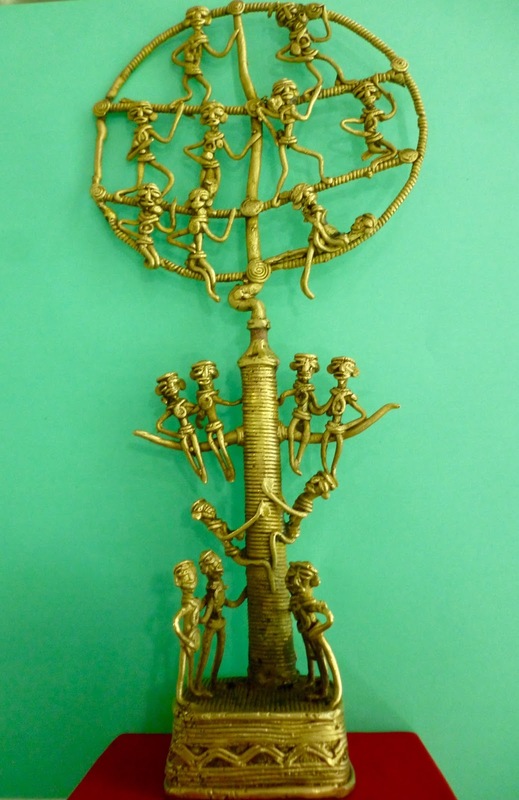 Photo above is a brass tree of life statue, given to us by the Aarambh School in Raipur. It's a traditional Indian handicraft from Chhatisgarh.